Electron Beam Engineering was selected by Tribogenics because it is an established precision electron beam and laser beam welding facility specializing in working with complex components, as well as having a reputation in the industry for quality work. Electron Beam Engineering, Inc. (ebeinc.com), an expert in precision electron beam and laser beam welding, has been chosen to be supplier of record for the $20 billion X-ray industry’s first triboluminescence based handheld XRF analyzers launched last month by Los Angeles based X-ray pioneer Tribogenics. The initial welding assignment consisted of welding small electrical feedthroughs and a larger vacuum fitting into their respective holes to the center of an end cap. Once the welding was completed, EBE’s quality control department was to perform a helium leak vacuum test to assure the integrity of the welded components. After this testing, EBE determined that the feedthroughs were leaking. The customer supplied feedthroughs were ceramic with pins brazed in place, and were not tested by either Tribogenics or EBE prior to welding. Laser welding of the feedthroughs was used initially, but the pins in each part were getting overheated. EBE also found that the design of the machined holes in the supplied endcaps could be causing additional welding problems. EBE recommended that Tribogenics go back to their supplier and relay the technical issues that were affecting the yield. They also requested that a design change be made to the features of the machined holes, such as a step to improve the fit-up of the feedthrough. “Because EBE was able to pinpoint the exact location of each rejected part, we were able to work with our vendors to improve the incoming parts tolerance and ensure that appropriate QC steps were made to ensure that future leaks were not a result of the welds,” added Valentine. To speed up the leak testing, EBE also suggested machining an O ring groove in the baseplate that could be utilized with a custom leak test fixture. The corresponding test times were now cut in half. Tribogenics and EBE decided to perform an extra inspection step using a microscope at each of their locations before attempting to weld on any parts that were visually suspect. Even with these changes, there were still occasional instances of leaking feedthroughs resulting in unusable endcaps. Since the cost of these are significant, EBE began a rework plan and worked with Tribogenics QC department and in-house machine shop facility so that the leaking parts could be reclaimed using a CNC machining process which increased part yield and reduced scrap. EBE was so impressed with the performance of the “Watson,” that they purchased one for use in their own job shop to check that customer supplied metals meet the AMS and other international standards for the composition of the metals. To learn more about Electron Beam Engineering and their wide range of electron beam and laser beam welding services, please visit ebeinc.com or call 1.800.EB.WELDS (1.800.392.3537). You can also follow EBE on Facebook, LinkedIn, and YouTube. Electron Beam Engineering provides precision electron beam welding and laser beam welding services throughout the United States, Europe, and Australia. EBE is located in Anaheim California and specializes in working with complex components for a variety of applications including medical, sensor, aerospace, and automotive. Richard Trillwood founded EBE in 1991 and is the designer of the world’s first compact production electron beam welding machine from which he has developed a wide range of precision laser and electron beam welders. In 2010, EBE was awarded “Manufacturer of the Year” by the Anaheim Chamber of Commerce and has earned a number of certifications in the welding, medical, and aerospace industries. ebeinc.com. Based in Los Angeles, Calif., Tribogenics is a leading innovator of triboluminescence based X-ray technology for industrial, medical, and scientific industries. It’s new Watson™ XRF hand-held analyzers remove the risk of error in manufacturing QA/QC environments by performing non-destructive testing (NDT) and PMI of metals and alloys. Initially, Watson™ is used in scrap metal recycling, metal fabrication, machining and manufacturing products for use in the aerospace, automotive, medical, military, scientific and industrial sectors. 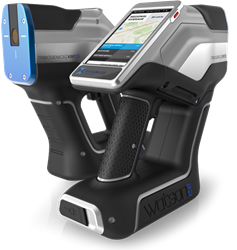 Watson™ is the X-ray industry’s first ever sub $10,000 XRF analyzer. tribogenics.com/products or call 1.855.972.9123.